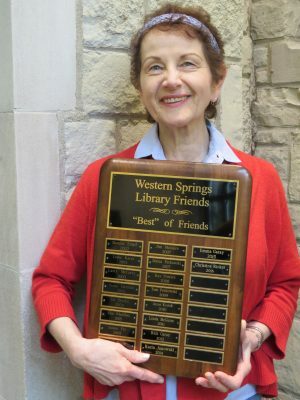 On Wednesday, May 25, The Library Friends presented their 2016 “‘Best’ of Friends” award to Christine Ricker. The Friends credited the publicity she did as the Library’s PR Rep as a big reason their book sales have been so successful. Christine said it was a team effort involving many staff members. Past recipients of the award include Donna Perkowski (2007) and Linda McGuire (2011) who were also honored by the Friends as the outgoing co-chairs of 33 book sales. A plaque with all recipients’ names hangs in the Library foyer. They’re the “Best”!